A5 booklet of 8 pages, an A5 sheet of decals. Excellent decal sheet printed by Cartograf. In perfect register with minimal carrier film. Comprehensive instructions and photographic references included. Minor, but one to watch – individual letters and number codes means a bit more fiddling when applying the decals but the end result is virtually no carrier film between them. This decal set gives a number of options for the all-white schemed Victors, with high quality decals and instructions. Ideal accompaniment for the Airfix Victor kits. The Handley Page Victor was the last of the 3 “V-Bombers” developed and produced for the RAF during the Cold War. The Victor first flew in June 1956 and was removed from nuclear duty in 1968 when cracks were discovered in the airframes. A reasonable number of Victors were converted to reconnaissance roles as well as a refuelling tanker role, which was its final one. 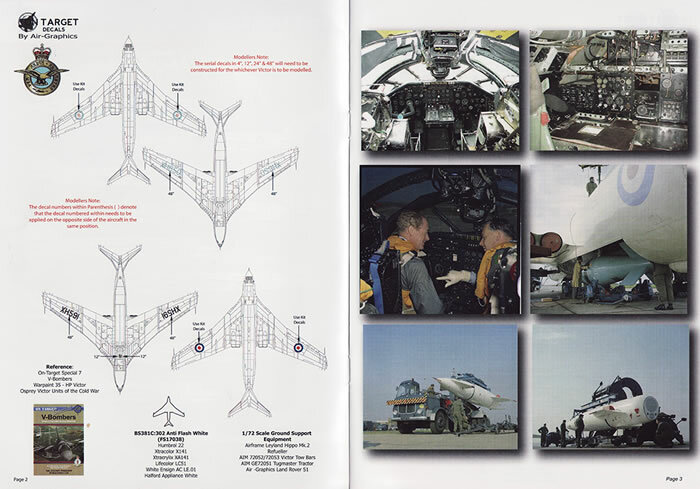 The Victor had a futuristic-looking and streamlined form with 4 turbojet engines in the wing roots. It also had a prominent chin bulge that contained targeting radar, nose landing gear and the auxiliary bomb aimer’s position. Whilst in the nuclear delivery role, the Victor was finished in an over-all anti-flash white colour scheme, designed to protect the aircraft against damaging effects of a nuclear explosion. And this is where we meet the lovely set of decals. Air-Graphic Models has been around for a while, mainly with upgrade sets etc and now have got into decals in a serious manner. 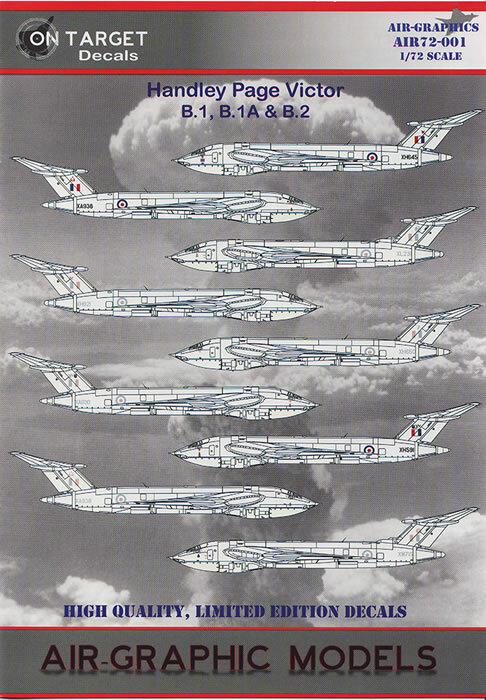 They have produced a lovely set of Victor B.1 and B.2 decals for a number of over-all anti-flash white aircraft active between 1958 and 1964. 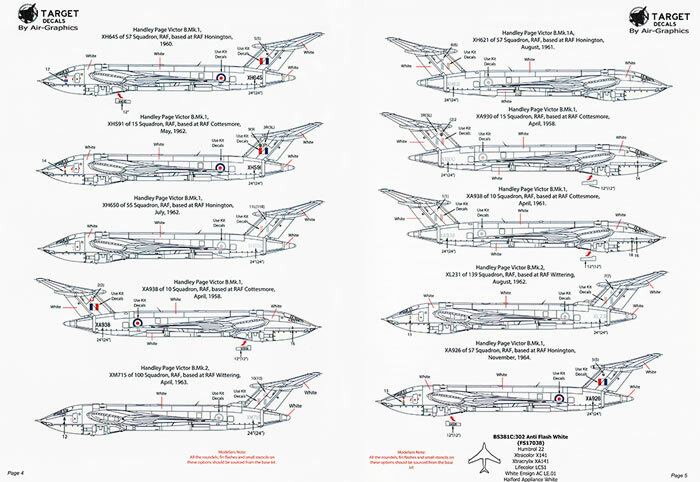 The decal set covers 10 aircraft with 3 variants included. The decals exhibit a high degree of printing quality, which you would expect being printed by Cartograf. They appear thin and have minimal excess clear carrier film. 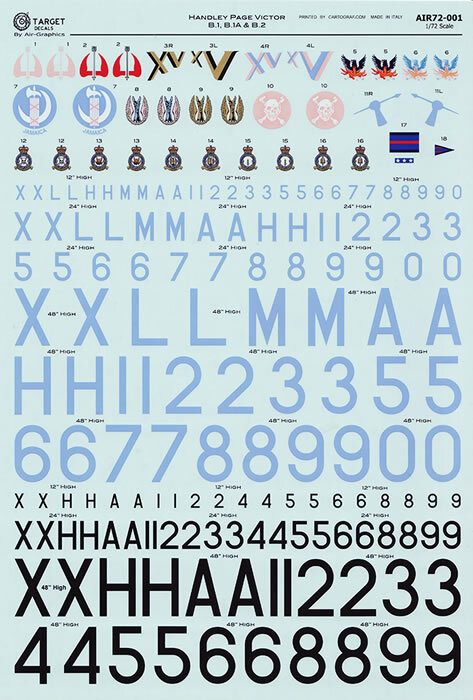 The decal sheet has the Squadron badges at the top and then a range of serial codes and numbers in 2 colours, pale blue and black, and in various scale heights, which are well labelled. This will enable you to create schemes for the many aircraft, but you will need to align and space code letters and numbers carefully. This practical step removes the slabs of clear carrier film you would traditionally have but does create the extra degree of fiddling with positioning them evenly. The instruction booklet, is a quality little production as well which I think is one of the best I’ve come across. Not only is it printed on good semi-gloss heavy paper, it’s stapled like a real book, so you don’t have the inevitable papers everywhere that comes with the “folded” style one sees more predominantly. 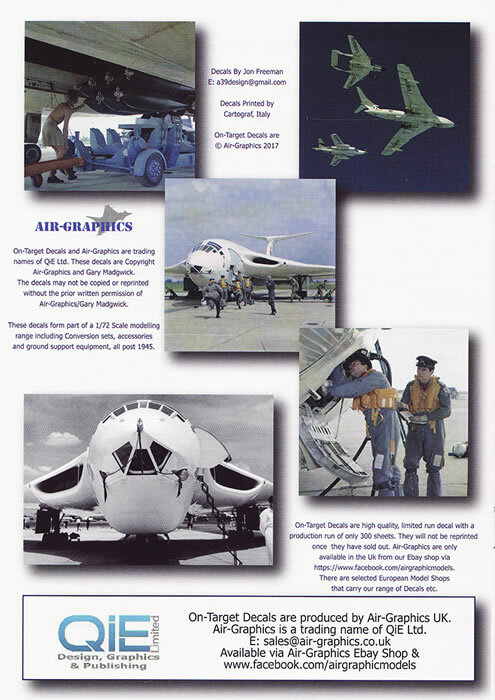 All making this a quality production, is the 2 pages of good colour photographs of the Victor interior, exterior, being loaded etc. A wonderful and very useful touch Air-Graphic. 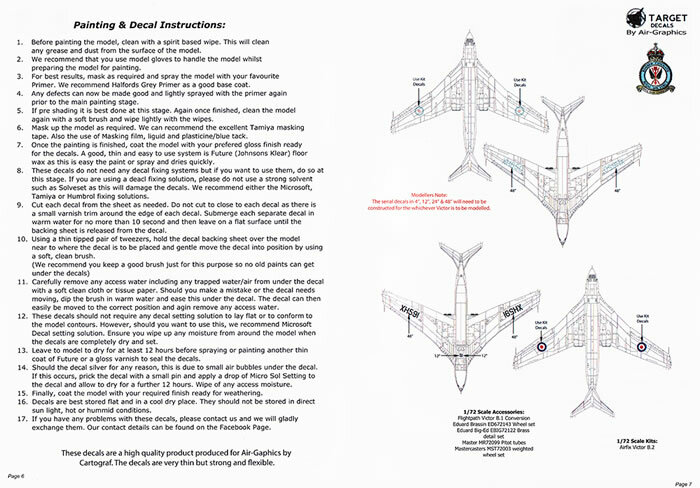 If you like the “V-Bombers” of the 50’s and 60’s, this decal set will provide you 2 with options for 10 great white nuclear bombers, with excellent quality decals. This decal set is highly recommended.